Facebook is in the midst of transforming the video content it hosts, reworking its viewing and advertising experience in a bid to capture more of the $70 billion in advertising dollars that currently flow to television. The most popular videos on Facebook are still short, zippy content with bright, eye-catching visuals, but the company’s investment in professional content, particularly in its Facebook Watch product, is beginning to pay dividends. Facebook announced last week that it would start introducing pre-roll ads in Watch, and it solidified rules for its mid-roll advertising (which it calls “ad breaks”). The company is tweaking its newsfeed algorithm to highlight more long-form video content, and is adding more exclusive content that has a chance of breaking through the clutter. To take advantage of that opportunity, Facebook is betting on TV content. Starting in January, Facebook Watch will host a live show, “Mixed Match Challenge,” produced by the WWE. WWE programming is routinely among the most watched shows on cable TV, averaging more than three million viewers each week. WWE has been a staple of cable TV, and launched its own over-the-top streaming channel, WWE Network, in 2014, well ahead of other standalone streaming offerings. WWE is betting that Facebook can be to WWE Network what its cable shows were to its pay-per-view events: a major free draw to bring in viewers who will be hooked enough to pay for the premium product later. 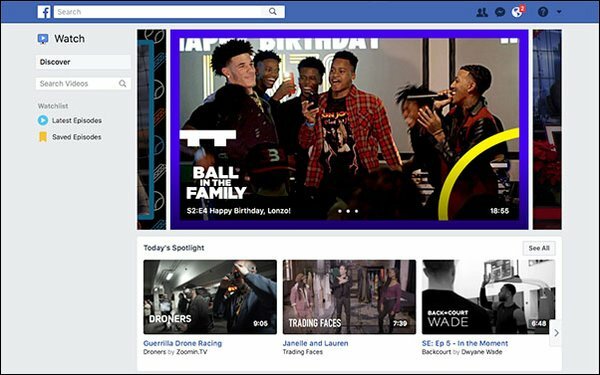 As Facebook refines its original programming to include more live and premium content from companies that have TV experience, it's also betting its revamped advertising experience will boost revenue accordingly. While Facebook has had mid-roll video for some time, and has started to allow branded content on its platform, the move toward pre-roll ads is the biggest sign yet that Facebook is serious about securing major ad deals. YouTube, the undisputed leader in free streaming video, relies heavily on pre-roll video, but is plagued with brand safety concerns. Facebook is hoping that its walled garden allows for advertisers and media buyers to buy confidently. Facebook is also expanding the length of its programs on Watch, from a few minutes long for many shows, to more than 20 for the WWE programming. The extended length of progressional programming, the revamped advertising structure and the refined algorithm are all part of a plan to keep users logged on and engaged. “Generally speaking, all of these guys [Facebook, Snapchat, Instagram] in some shape or form are trying to build the future of television, trying to build environments where people spend huge amounts of time and consume lots and lots of video -- I think, ultimately, so they can have an advertising product that in some shape or form rivals television.” said Group Nine Media CEO Ben Lerer, speaking at a conference earlier this month. 2 comments about "Facebook's Plan To Take On TV". Ed Papazian from Media Dynamics Inc, December 19, 2017 at 8:32 a.m.
A lot of the usual propaganda about millennial viewing "falling off a cliff", etc. as if to suggest to those who don't know much about media that you can't reach the all-so-important, but not really, millennials unless you buy time in ---or before ---FB's videos. FB has a great deal to learn about media planning and buying the way that savvy advertisers do it and this may be a big lesson for the entire digital ad selling industry. LOL, folks. John Grono from GAP Research, December 19, 2017 at 3:56 p.m. The view from inside a bubble. But seriously Ed, when you can reach 140%-150% of the population you're on a winner!